We’d love your help. Let us know what’s wrong with this preview of Age of Rebellion Beginner Game by Max Brooke. The Star Wars™: Age of Rebellion™ Beginner Game is the perfect entry into the Star Wars: Age of Rebellion roleplaying experience for players of all skill levels. With its complete, learn-as-you-go adventure, players can open the box and immediately dive into their roles as members of the Rebel Alliance, desperately fighting against the superior might of the galactic Empire The Star Wars™: Age of Rebellion™ Beginner Game is the perfect entry into the Star Wars: Age of Rebellion roleplaying experience for players of all skill levels. With its complete, learn-as-you-go adventure, players can open the box and immediately dive into their roles as members of the Rebel Alliance, desperately fighting against the superior might of the galactic Empire. Pre-generated character folios keep the rules right at your fingertips, while custom dice and an exciting narrative gameplay system advance your story with every roll. 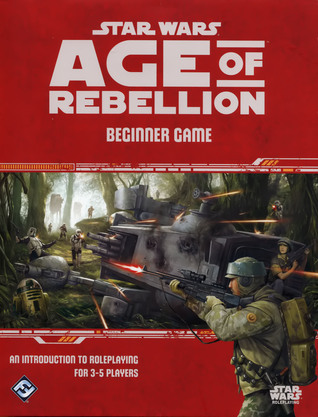 To ask other readers questions about Age of Rebellion Beginner Game, please sign up. Excellent game mechanic and a good introductory story. I wish Fantasy Flight would include a poster map like the one in this box in all of their Star Wars hardcover adventure-books. Another complaint: the box should open like a boardgame-box with a bottom and a top though instead of like a slightly improved cereal-box. Good introduction to the FFG system. The enclosed adventure looks very promising! The box is still the cheap, thin cardboard the Edge of Empire Beginner Box used. Good value considering the included dice and the adventure.